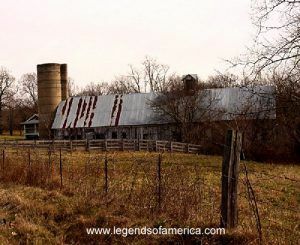 The trail of Route 66 from Lebanon to Springfield will take you away from the interstate on a winding path that is dotted with semi-ghost towns, old barns, vintage buildings, and a roller-coaster ride over the rolling hills. A beautiful stretch of highway, this section was bypassed earlier than the establishment of I-44, when a new four-lane alignment was constructed in 1957. Along this quiet stretch of pavement, you will see many historic views of Route 66, along with roaming cattle, many tumbling buildings, and a couple of historic towns that have still survived. The first stop along this old route is Phillipsburg, which provides a peek at several vintage buildings, including what appears to be a two-story general store and a large school building. Though the town still supports a very small population with an active church, it is mostly filled with historic structures that speak loudly of an era of better times. Beyond Phillipsburg, you continue through the rolling hills to Conway, which has faired better due to its closer proximity to I-44. Conway was born of farmers who began to settle the area in the late 1860s and was named after a railroad contractor. The first store opened in 1869 and the settlement slowly began to grow. By 1874 it had its first school in a one room log cabin. By 1880, the town had a new two-story building that was used for the school, church and area meetings. In 1913, a tomato canning factory was built in Conway and trainloads of tomatoes began to be shipped from the area. By the time Route 66 pushed through, the town boasted several businesses including the Electric Theater, the Stone Motor Company, and a bank. Today, Conway is not a ghost town but remains a very small community of just a little more than 600 people. About six miles west of Conway, look for the long defunct Abbylee Modern Court. Surrounded by vegetation, you can barely see the sign, but the vintage court still stands, appearing to rent its units as apartments. A few more miles down the road the tiny town of Niangua presents itself, which still hangs on with the influence of the local farmers. 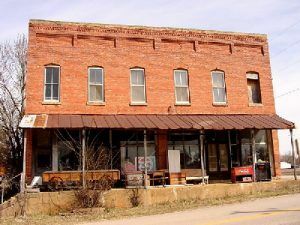 Niangua, sometimes pronounced “Niangee” by the locals, also displays more vintage buildings, most of which are no longer in business, even though the town still supports over 400 residents. Signs of better times! Soon, you arrive in Marshfield, the county seat of Webster County. The town was laid out in 1856, primarily called home to farmers and ranchers of the area. When the Civil War began, the town was the site of two Civil War skirmishes. The railroad boom after the war stimulated the community as a dairy, poultry and livestock producer. Today, Marshfield is a rapidly growing community supporting more than 4,500 residents and was the one-time home of Edwin P. Hubble. The community now proudly displays a ¼ scale replica of the Hubble Space Telescope on the town square.